Is the media finally beginning to wake up to farce that was agreed in Paris? Pres. 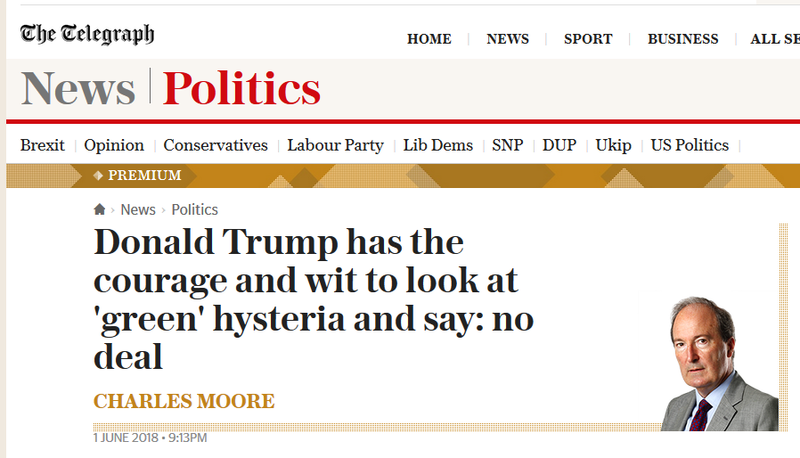 Trump is hated by so many people, the SNP, very many of his compatriots, and is widely feared. However, he is showing much more sense than his detractors, e.g., on wind turbines, Greenery, including fracking, attempts at better relations with N Korea, foreign military adventures and, it seems, reducing taxation: all of these should help his nation, and, if they are successful, he will have shown a great contribution and will enjoy the last laugh, fingers Ad. Sorry about the typo: last line should read “fingers X’d” ! Charles Moore’s article is very welcome, but our government is still seeking to lead the world in decarbonising the economy, as if we were about to face disaster. BEIS have just released a report on CCUS which include the phrase “reducing pollution from the air we breathe” referring to reducing CO2 in the atmosphere. What hope is there when the government can publish such rubbish? Trump is now, and has from the beginning, been portrayed as a loose cannon that is in over his head, and this article has a whiff of that same meme. This American is sick of that BS. The only damage he is causing is to the progressive socialists institutions and agenda and to the enemies and to countries which have been taking advantage of what was US trade policy. He is doing what he said he would do in the campaign and thus what he was elected to do and getting it done despite the massive forces of the establishment, the deeps state, and their press arrayed against him. He is keeping more promises to the those who voted for him than any POTUS anyone alive can remember. If they don’t kill him and he runs he will win reelection because as far as scandals goes the left has shot their wad and it has proven ineffective. The rules of the game have changed and the left and their politicians just keep playing by the old rules and insulting anyone that likes the new rules. This kind of thing only drives more people into the Trump camp. Trump will be playing his trump card before the midterms. That card is a possible government shutdown over funding for the wall. The democrats and establishment republicans that are beholding to the US Chamber of Commerce and must fight to prevent the will of the US voters being implemented will once again have to expose themselves as defending their policy on illegal immigration that the majority of US voters abhor. We won’t get another Trump after he is gone but his legacy is already ensured. Though I wasn’t sure what I was getting when I voted for Trump I KNEW what I would be getting if I and others like me didn’t. I voted for Trump figuring that no matter what he would put conservative justices that would rule based on the law in the Judiciary. He has done that and is doing that in spades! And THAT will be the legacy that is most enduring even if his successors over time inch back on everything else he has done. You saved me the trouble of stating most of this. People would do well to read “The Art of the Deal.” I got a copy with a signed bookplate for a very modest campaign contribution in the summer of 2016. I chuckled as I read the book and realized at every turn that I was hearing the same person at the rallies. He said that with every project he had 4-5 methods to realize his goals. The implementation of the tariffs is a negotiating tactic, but he is also very serious. It gets their attention. His working of North Korea was masterful. Also delightful was to hear the media being driven nuts–a short trip. Although I knew he was going to win in early summer 2016, it was so pleasant to wake up at 3:40 on Nov. 9, turn on my phone and read: “Donald Trump elected President.” It was my 71st birthday. At his recent rally, he said what makes me cry every time I hear it: “I will never let you down.” And he does not, unlike many prior decades of promises from others. Hi Joan. You’re right. Trump is playing the game his way; as he knows very well how to do. To those who were not bigots it was plain to see his cancelling of the Korea talks was a negotiating ploy: He scared the sh1t out of a few fools (mainly reporters) and got Kim to come back to the table on his (DJT’s) terms. I think one his methods must be based on: ‘cut the crap’. His cancelling of the Korea summit, not talks, was Trump telling the Chinese to shove it where the sun doesn’t shine. Fat little Kim, is a bargaining chip for the Chinese in their trade talks. For the first time ever the US is playing hard ball to stop the inequities in trade policies that give the Chinese access to US markets while denying the US access to theirs. A summit with Kim and the stupid talk of the Nobel Peace prize for Trump were the come on. An offer for a quid pro quo that would in conventional political thinking, enhance Trumps reputation though it would never have happened because the socialists in Norway would never give Trump that prize no matter what he did. Trump let the Chinese know he wouldn’t play their game when he cancelled the summit. Kim, and his envoy currently in DC made trips to China to find out what they wanted them to do next. This game is being played on several fields at the same time. You see NAFTA has allowed the Mexicans and Canadians to import Chinese made parts and then sell them in the US there by avoiding tariffs. Parts that could have been made in the US or Canada or Mexico. THAT is going to come to an end even if it takes the cancellation of NAFTA to do it. And the ending of the abuse of NAFTA is what has both Mexico and Canada so upset. It also being played out with the EU. Although they have been less than friends, South Carolina Senator, Lindsey Graham has become an admirer and supporter of President Trump. Kim tried that and found out when Trump cancelled the meeting which caused the media and political pundits to have the vapors. Those of us who have read “The Art of the Deal” and have watched Donald Trump through the campaign and his first 16 months in office understand what he is doing. We love it. As a Brit I was horrified at the prospect of either Hilary or Donald being voted in as POTUS. the best of a bad pair I figured. I very rapidly changed my tune as I watched Donald begin to systematically deliver on each of his campaign promises and realised the guy is doing what none of our British politicians have done since Winston Churchill and Maggie Thatcher. If Brexit wasn’t enough to convince the world something is wrong with global politics, Donald brought the message home with a resounding thump. And now the Europeans are lining up to overtly threaten America with retaliation for his steel and aluminium tariffs. They have been doing this to the UK since the Brexit vote but hiding it behind their sleazy bureaucracy. Brexit meant retaliation from Europe and Donald has flushed the conspirators out by exposing their predisposition for revenge politics. I have said it before, but it’s worth repeating; I truly hope the UK comes to its senses and gets on board with America to enjoy the fruits of Donald’s endeavours in making the world a better place to live in. Europe is a dying socialist utopia, and it’s suffering the fate of it’s own elitist behaviour. I’m convinced Donald’s second term is a shoe in, hopefully a landslide, he deserves it for having the courage to treat his country like a business, which is what every country in the world really is, a profit making endeavour. He’s courageous enough to stand up and tell the world his only interest, indeed his job, and sworn duty, is to care for America. You guys are damn lucky to have him and I only hope the UK get’s its head out its arse and starts taking him seriously. I’d like to think you are right, but where are the sensible UK politicians – apart form Nigel Farage? Sadly, there don’t seem to be any. But there will be come the next election when America is booming and Europe is dying a death of a thousand bureaucrats. I sure hope you guys get a handle on it before it’s too late. I wish each and every one of you which want your government to leave your liberties and pocketbooks alone, the very best! God save the Queen! Sadly, the royal family are in our pocketbooks as well. Well said, Hotscot. John Sopel, on R4 this morning didn’t know what to say. His anti-Trump reportage is becoming an embarrassment to him & the BBC. Paul, glad to see you over at the loooong comment thread at the DT. I figured not to bother when fools like ‘Return of the King’ were spouting such rubbish in support of CC. The silliest comment was to compare CC with gravity, ie: they are both settled science. But I bet that commenter could not tell you what gravity is. I just hope the article hits a few heads and provokes some thought. At the risk of repetition, it should again be pointed out that “decarbonizing” the atmosphere back to the 350 ppm emphasized in Copenhagen, and still urged today by many, is quite impossible when one realizes that the mass of 50 ppm of oxidized carbon is 100 billion metric tons. This 100 gigatons of carbon dioxide cannot be technologically captured and safely buried within any plausible human timescale….and if it was accomplished it gets us back to the climate of 1987. Hardly worth the time and effort. But, that’s the path we are on. Someone besides Mr. Trump needs to wake up? Especially those at 350.dot org. and at NASA “dot” Hansen where 350 ppm is the ultimate goal to save the planet from catastrophe. 350ppm. What a joke. It’s only 200ppm away from the beginning of extinction of mankind when meaningful plant life begins to die. I would far rather see a steady increase to 1,000ppm than risk the certainty of the planet becoming yet another barren rock floating in space. We are also at one of the two coldest periods the planet has known before descending into an ice age. Anyone stupid enough to believe that atmospheric CO2 causes global warming, and deliberately promotes the cooling of the planet by its removal from the atmosphere, ought to be tried for global terrorism. Hot Scot.. It is indeed a joke when one considers the geological evidence that back in the Tertiary about 34 Myr-ago the CO2 was already double what it today and the calcium carbonate secreting planktonic plant and animal life was thriving in spite of a pH lower than that of today. Global warming is not a hoax but trying to mitigate it with CO2 adjustments certainly is. I presume your reference to another very cold time was to the end Ordivician Ice Age when the CO2 was around 3,000 ppm. And considering that England has an answer to life being threatened by CO2 with the white cliffs of Dover (to which should be added the South Downs and some parts of the French coast) which were laid down by minute marine organisms during the Cretaceous when the CO2 level was 1650-1900 ppm. No sign of acid seas then, nor when the Jurassic coast (and Cap gris-nez etc. across the Channel) was laid down when te CO2 was well over 2,000 ppm. Certainly both Ages were warmer than today but ocean circulations were different and probably there was more volcanic action, so there is no need to link that to CO2. CC if anyone starts spouting about the ‘benefits of the technology fo CC’ recommend them to and forthwith to visit a medical doctor specializing in head trauma. Take Pakistan’s INDC. In 2015 they estimate emissions were 405 MtCO2e, up from 182 in 1994. As a result of ambitious planned economic growth, they forecast a BAU of 1603 MtCO2e in 2030. However, they can reduce that by 20% with about $40 billion in finance. That is, with $40bn, average annual emissions growth from 2015-2030 will still be twice that of 1994-2015. Plus Pakistan would like $7-$14bn pa for adaptation to climate change. Or Bangladesh’s INDC. Estimated BAU increase in emissions from 2011 to 2030 is 264%. They will unconditionally cut this by 5% and conditionally by a further 15%. The BAU is 7.75% annual emissions growth, cut to 7.5% unconditionally and 6% with lots of finance. I do not blame either country, or the many others taken similar strategies. They are basically saying that they will do nothing that impedes trying to raise living standards through high levels of sustained economic growth. They will play the climate change game, so long as nobody demands that the Governments compromise on serving the best interests of their peoples. The climate alarmist community are too caught up in their groupthink to notice.